I said I wasn't going to have much time this week, but this dinner (or snack) only took 5 minutes. I got hooked on tofu when I was a vegetarian and still enjoy it. Unfortunately Jon doesn't eat it so I only cook it when he isn't home. With this dish, he doesn't know what he's missing! I took 1 block of extra firm tofu and sliced it into three large rectangles. It's important to press it - place between 2 layers of paper towels and place something heavy on top for about 30 minutes to press the water out. I then cut each large rectangle into three smaller ones. I sprinkled each one with a tiny bit of cayenne, onion powder, garlic powder, and chili powder. For the breading - I mixed 2 eggs with some soy sauce in one bowl. Yes, it looked a little gross, but believe me, it worked! I mixed the breading in a separate bowl. I had to mix some bread crumbs in with my panko since I didn't have enough panko to use on its own. I also added some garlic powder and red pepper flakes. I dipped each piece of tofu in the egg and then the breading, and then put it in a large pan that had been coated with vegetable oil. Each piece cooked for about 30-45 seconds per side and that was enough time to get them to a nice crispy, golden brown. 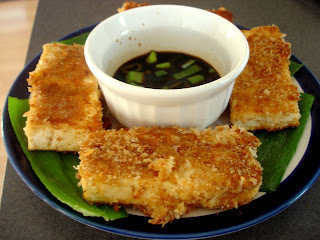 Dipping sauce: soy sauce, 1 shake of sesame oil, 1 chopped green onion. They came out so nice and crispy that it was almost like eating a mozzarella stick. I may have to make these again when Jon is home - he just might like them!! yum! I'm a semi vegetarian (lol!) - used to be a full one, but then I met DH who is a total carnivore so I decided to gradually add the chicken and fish back in.